Every year we ask our summer intern to do a survey of cover art elements for the top fantasy novels published in the previous year. This year, our wonderful intern Jennifer looked at covers from 2009, and compared them against 2008’s findings. Over the next few days we’ll be releasing a number of charts that show what she found. After the jump, some initial observations on the data. And join us in the comments to talk about the trends. 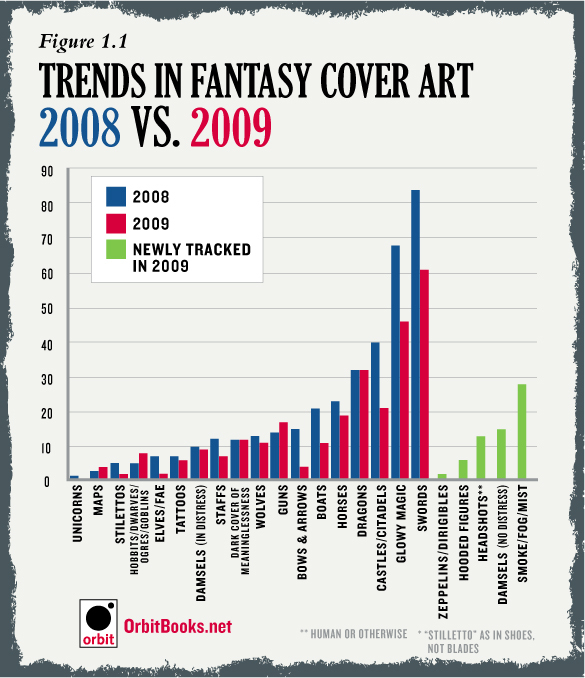 1) We have concrete evidence that the big three fantasy cover clichés (“castles”, “glowy magic”, and “swords”) are in decline. The 50% reduction in castles can only mean one thing. 2) The number of dragons on covers held steady this year. The dragon population seems to be in perfect balance – but we can’t tell if that’s because new dragons are being born to replace old ones, or if last year’s dragons are just really healthy. 3) This year we didn’t spot a single unicorn (though it’s possible a unicorn was hidden under one of the hoods.) To all unicorn-lovers out there, don’t lose heart. Unicorns are rare – like double rainbows — so a year without them will only make their inevitable reappearance that much more magical. In the meantime, there’s always this. We also introduced a few new categories this year. 1) Hooded figures: Not as many hooded figures as you might imagine, but early indications suggest that this category might explode in 2010. 2) Smoke/fog/mist: Smoke and mist are sometimes mistaken for “glowy magic”, so to ensure that “glowy magic” is accurately tracked, we introduced this category to weed out non-magical atmospheric disturbances. 4) Zeppelins and Dirigibles: We added this category to track the rise of steampunk and Victorian fantasy. We briefly considered “brass-goggles” and “gears” but airships seemed to be the most reliable indicators of this trend. Plus, they can be spotted at a great distance. It should go without saying that Orbit cannot be held responsible for the accuracy of data included in the Chart of Fantasy Art, so use at your own risk. And we’d love to know what you think in the comments. What are the trends you’re seeing in fantasy cover art? What do you want to see more or less of? Let us know!